Art is a child-driven, open-ended process and is an important part of developing self-expression. 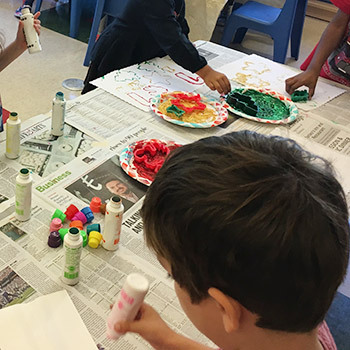 A wide variety of art media and tools encourages children to recreate their own reality, using representational art forms that demonstrate how children see their physical and social worlds. It can be both fun and inspiring to paint with things like Matchbox cars and golf balls, or to create recycled-materials collages. The process is more important than the product! The outdoor areas provide a natural contrast to the classroom with fresh opportunities for social interaction, physical and imaginative play, collaboration and problem solving. We offer four outside yards featuring play structures, sand areas, and toys. A bike path and more than three dozen bikes and riding toys help children practice gross-motor development, whether it's a two-year-old who's not quite ready to pedal yet, or a five-year-old zipping around on a balance bike. Kim Kludt, of Start Fitness, leads your child's class in gymnastics each week. The class focuses on gross motor, core strength, balancing, and age-appropriate tumbling, as well as parachute play and movement to music. This program is designed for two year olds through Pre-K aged children. Teachers gather the older students briefly each day on the carpet to welcome them to their day at school. This valuable time is used to help establish and reinforce familiarity with routine and social concepts, like day-of-the-week, the calendar (current day/date/month/year), the weather, seasons, patterns and basic counting, how many days we've been in school. Depending on the class, a student is often standing up next to the teacher to help guide the class through these discussions, offering low-pressure and fun opportunities to be comfortable with public speaking. A teacher-led time that differs in length and scope depending on the age of the class. Music, movement, flannel stories, books, puppets and social interaction are all a part of the circle "magic". Learning how to behave appropriately in the circle group is a skill that prepares children for other large group activities. Many social, emotional, and academic skills are built-upon with practice at circle time. These activities are specifically chosen for the children by their teachers to introduce or enhance particular skills in the classroom. A variety of engaging activities are modeled and selected to support: attentiveness, memory, thinking, following directions, fine motor development, recognition and value of numbers, visual discrimination and classification, recognition of upper-and-lower case letters, phonemic awareness, patterning, sequencing and task reasoning to finding solutions. Children actively participate in self-directed projects with concrete materials, fostering initiation, independence, follow-through, and completion. The class is divided into three small groups to encourage learning in a structure different from the whole-class environment. The groups might work on a special project, go for a nature walk, listen to a story, or share in fun, informal conversations. Participation in smaller interactive groups fosters reciprocal discussions, listening skills, cooperation, and compromise. This very important part of the day supports deeper relationships between children, and strengthens the bonds between teacher and student. Children also have the chance to share their feelings and ideas with the group, to gain confidence in expressing themselves and their individuality. The children are provided a peanut-free snack each day. Snacks typically include fresh fruit, various crackers, Goldfish, or pretzels, and water (Pre-K children bring their own water bottles to class). 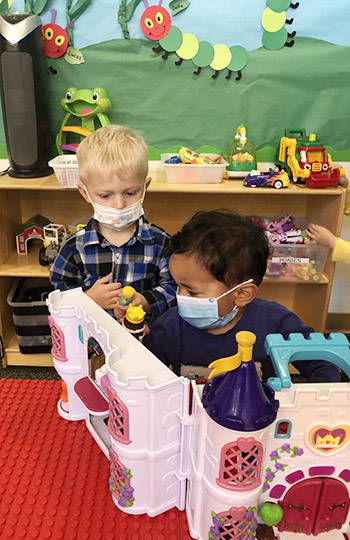 It is not only a chance to socialize in a small group setting, but an opportunity for the children to practice manners and routines they can use at home, on play dates, or when they are out with family and friends.